South Bend-based AM General, a maker of specialized military and commercial vehicles, has landed another major contract from the U.S. military. 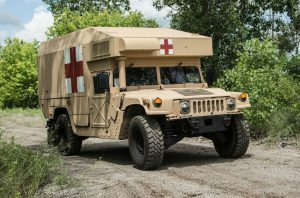 The U.S. Army Contracting Command placed an order with the company for 648 M997A3 High Mobility Multipurpose Wheeled Vehicle (HMMWV) Ambulances, valued at $185 million. As part of its public-private partnership with the Joint Manufacturing and Technology Center (JMTC) at Rock Island Arsenal, AM General will begin providing the first chassis systems to JMTC this spring, where the ambulance shelter fabrication and final assembly will take place. The first ambulance deliveries are scheduled for later this summer, the company said.